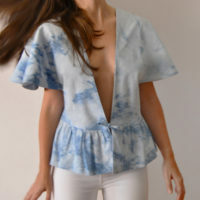 We are two sisters driven to create unique handmade fashion. We jumped into this adventure printing our own designs on t-shirts. Now, we are excited about making new projects that involve all the creative process from a green and care perspective. We like mixing artisanal and innovative techniques willing to discover new processes. Always enjoying the journey! We have a lot to say. We like to reverse, transform and play with our ideas trying to think differently and reflect who we are. We create unique and original designed pieces that belong to a limited edition. There is no need to dress like everyone else. We believe a conscious way of creating and consuming is possible. So we propose up-cycling, zero waste and organic materials.